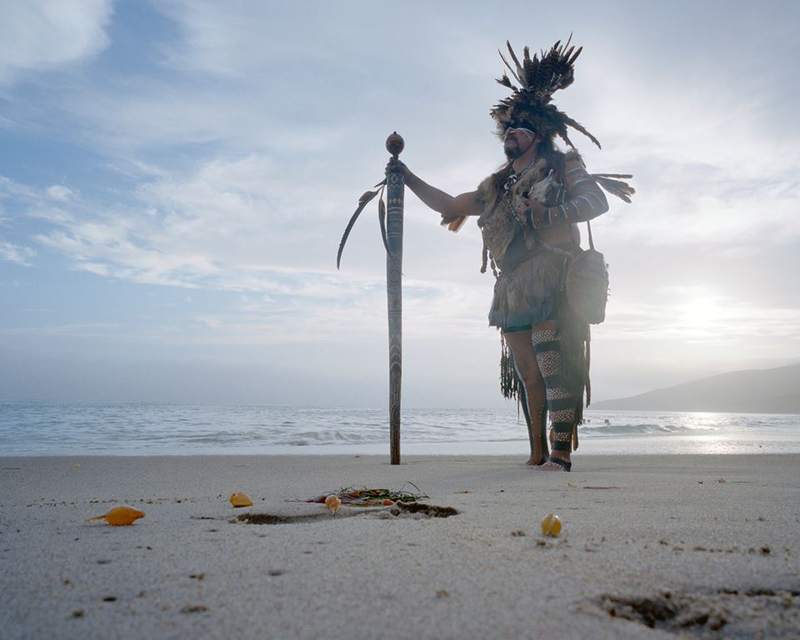 Mati Waiya, Chumash Ceremonial Elder in full regalia at Nicholas Canyon County Beach in front of Wishtoyo Chumash Village. More and more, public officials are seeking the participation of Native leadership, using long-held traditional knowledge to inform community governance. This past December, Malibu City Council kick started this contemporary practice by asking Chumash Ceremonial Elder Mati Waiya, founder of the local non-profit Wishtoyo Chumash Foundation and cover feature of The Local Malibu's December issue, to conduct the swearing in of City Council Member Rick Mullen. Mullen met Mati Waiya while on the campaign trail, through a mutual Malibu friend who connected the two before Mullen even took office. "I am honored by [Mati Waiya's] Presence at my ceremony and thankful for the blessing he bestowed upon me to guide me as I assume my responsibilities." At first glance, the image of a Chumash ceremonial elder cleansing the air of Malibu City Hall with magnificent feathers of the California condor might seem an unexpected juxtaposition of past and future, tradition and modernity – but perhaps this fusion of culture and politics should be prioritized in the public sphere. The Chumash people and culture of Humaliwu (also known as Malibu) are an integral and relevant part of the fabric that forms our current-day community. The inclusion of the First Peoples at any official event is becoming a more frequent occurrence as “newer” (non-indigenous) residents increasingly understand the benefit and need for acknowledgement of local indigenous heritage. Inclusivity and respect can only strengthen our community. Photo of Mati Waiya and Henry Stern. Mati Waiya was also asked to present a traditional Chumash ceremonial blessing for the swearing in of California State Senator Henry Stern, a young, enthusiastic first-term senator of the 27th District. Newly appointed Senator Stern was flanked on stage by public officials including President Pro Tempore of the California State Senate, Kevin de Leon, and Stern’s predecessor, Fran Pavley, and 26th District Congresswoman Julia Brownley to name a few. An audience notably full of young attendees reflected Stern's commitment to encourage the participation of community youth in the civic engagement. In spite of the political whirlwind in the beginning of the year, the ceremony set an optimistic tone for the event. Mati Waiya’s message imparted the importance of awareness and understanding of the history of the our area’s Indigenous People so that we, as a human family, can bring wisdom from the past and use it as a foundation for a brighter future. Photo of Senator Henry Stern swearing-in ceremony. Later that month, Mati Waiya was again invited to give an inspirational invocation, this time for the Los Angeles County Board of Supervisors meeting. “We come together today to hold the hands of the youth, to the birthright of our children to have a healthy world… When we were born into the world, we cried out loud – that is the sound of freedom. So never be quiet.” Mati Waiya’s speech was potent and resonating, leaving both the board and attendees inspired by his thought-provoking message. Photo of Luhui Isha, Julia BROWNLEY and Mati Waiya. The complex societal structures of Malibu’s indigenous peoples succeeded for millennia and are intimately connected to place. It is by no coincidence that the values and lessons taught by Native elders resonate with the goals and struggles of our contemporary leadership and the needs of the constituents it serves. The inclusion of Native elders in modern day local and state politics rightfully acknowledges the relationship between the Native community and their ancestral homelands. It is in the spirit of this message that we as human kind can move forward, together, to create global change. “Let us hold our children’s hands, and those who are not yet born, toward a world without struggle and without hatred.” It is through charting a new path - a rainbow bridge of hope and promise for the youth of tomorrow - that 13,000-year-old practices and traditions that bring new life and meaning to support our leaders, native and non-native. We share this spirit of social, economic, and environmental justice, protection of our Earth, and human rights for all people into the procedural politics that we have come to expect in 2017 and beyond.